Flash My Brain - Succeed with SAT, GRE, GMAT flash cards. 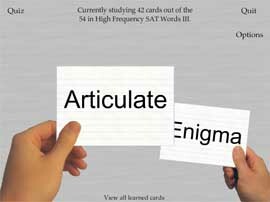 Succeed on the SAT with vocab and math flash cards. Flash My Brain helps you prepare for standardized tests like the SAT by offering you 1000s of pre-made cards and the ability to create the exact flash card stacks you need. Flash My Brain's flash card editors are very cool. Type up our own vocab flash cards and share them with your friends. Or draw out your own math flash cards to help nail your math score. All done? Print them out or start studying them. Play flash card games on Flash My Brain that sharpen your skills for tests like the SAT. Practice the process of elimination and master multiple choice exams. Positive reinforcement based learning encourages retaining the knowledge as long as possible, and mini-games make the learning process fun! Buy Flash My Brain for $29.95 and start studying for the SAT the Flash My Brain way. Learn, create, print and share flash cards with Flash My Brain!